With so many thousands of musicians having made music and contributed their ideas to the art over hundreds of years, it is very rare when something entirely new comes along. Chances are, it's already been thought of before. New popular styles only seem to emerge only once every decade or longer despite the speedup in communication and culture generally. But what innovation does take place comes mainly from people mixing existing styles in creative ways. The currently popular global fusion trend is an example, with people combining say Celtic and African sounds, or flamenco and hip-hop. This week we have another example of a group who takes two different, but rather less exotic, styles and mixes them in an interesting and very enjoyable manner. 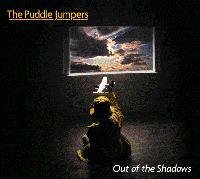 They call themselves the Puddle Jumpers, and their debut CD is entitled Out of the Shadows. The Puddle Jumpers hail from the Seattle area, popularly known as the city of grunge, but an area which has long harbored active jazz and folk scenes. The band calls their style "progressive folk," with the adjective a reference to the progressive or "art rock" bands of the early 1970s, like Yes, Emerson, Lake & Palmer, and early Genesis. Their folk aspect comes from a style of writing, and an undercurrent of acoustic instrumentation including mandolin. The result is a distinctive sound comprised of two old styles melded in an intelligent and musically skillful manner. And despite all the folk and progressive rock over the years, few bands have tried to combine the two. Some very early Jethro Tull and an obscure British band called Gryphon come to mind. With their melodic sense, they also at times recall the California art-rock band Ambrosia. But doing that kind of thing in the 1990s, in the age of "dumb and dumber" popular music is what makes the Puddle Jumpers especially interesting. Though the group's members are mostly veteran musicians, the band itself only got started in January of 1995, when Rick Vartian, a keyboard player for several groups, got himself an octave mandolin, a larger and lower version of the traditional acoustic instrument. A native of California, the 37-year-old Vartian had come to the Seattle area in 1991 to work for a recording console manufacturer. Previously, he had composed film scores, as well as music for various groups he had been in. He started composing on the octave mandolin, and began collaborating with Seattle native drummer George Short. They eventually added Canadian-born David McGrath and Chicago-native George Michael, not to be confused with the commercial pop artist of the same name, on guitars. All have contributed to the songwriting, with Vartian providing the lion's share of the 15 songs on their generous CD. Vartian also provides the bass through a convincing-sounding keyboard sampler, though since the recording of the CD, they have added bassist Tom Austin for their live shows. While the Puddle Jumpers call their music "progressive folk" the emphasis is on the "progressive," with elaborate arrangements and impressive production -- especially considering this was a do-it-yourself project, with Vartian also doing the producing and engineering. While the mandolin is usually lurking in the arrangements, the CD's emphasis is on electric instrumentation and intricate ensemble playing. Vartian gives it a further art-rock spin through his use of some very 1970s-sounding synthesizers and organs. Also from the art-rock stylebook are the high, dense tight vocal harmonies and the lyrics, which tend toward the philosophical. Unlike the symphonic rock of the past, The Puddle Jumpers compositions tend to be tightly edited and most time in an under four minutes. The folkiness comes in with some jig-like rhythms and the appealing melodies to many of their songs. Those whose memories go back to the 1970s will also hear another influence here and there -- a couple of guitar solos that evoke the Allman Brothers Band. And they combine that with a pop sense that harkens back to the Beatles-era British Invasion. The result is a very appealing album that has a kind of timeless sound, an up-to-date blend of ingredients that date back more than twenty years. The Puddle Jumpers have come up with an innovative and satisfying blend of styles by taking a healthy portion of the best aspects of 1970s progressive art rock, adding a folky undercurrent and bits of other influences ranging from Irish to country to the Allman Brothers. They add some excellent songwriting with intelligent lyrics and a very good melodic sense, combining them with sophisticated arrangements to come up with a genuinely outstanding debut release that's as likely to appeal to Baby Boomer fans of Yes and Jethro Tull as to younger fans looking for an alternative to alternative music. The album's production and sound are world-class. Vartian, in addition to all his playing and composing, did a excellent job of bringing up to date the elaborate sonic techniques that were part and parcel of 1970s progressive rock. Rick told me that he used a new digitally automated mixing console he had worked on at Mackie Designs before he departed the company to pursue his music full-time. The sound is commendably clean and mix just about perfect for the music. It sounds as if a little compression was added in mastering, but it's not too obtrusive. This independently-released CD also comes in a very attractive cardboard package that recalls fine old fold-out LP covers, instead of a standard plastic jewel box. The Puddle Jumpers' Out of the Shadows reminds us that refreshing music can still be obtained by the creative mixing of familiar styles. And that there's more to the Seattle area than just grunge. (c) Copyright 1996 George D. Graham. All rights reseved.